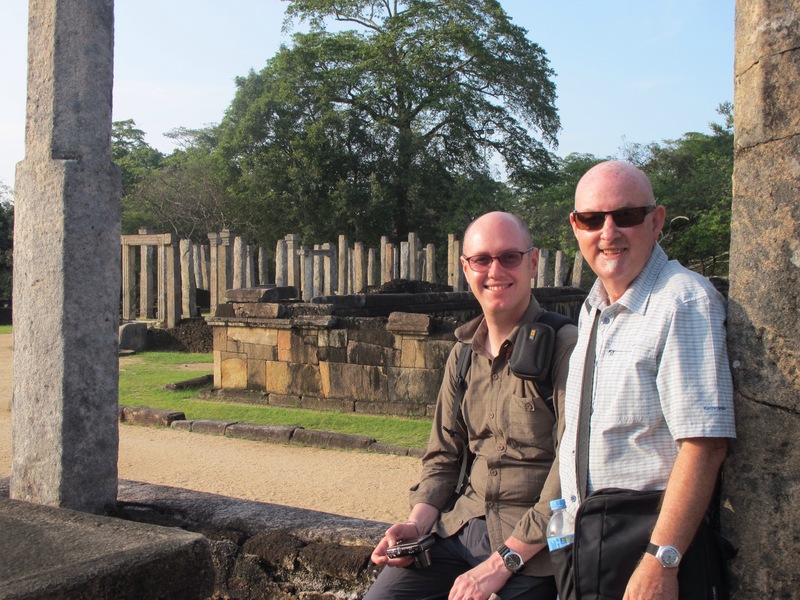 After arriving at the hotel in Polonnaruwa (the ancient capital of the second kingdom), we had lunch and a quick rest before exploring the 1000 year old ancient ruins of the area – once again on bicycles. The traffic is usually quite aware of the cyclists, apart from one local bus that nearly wiped out half of our group on a bend. Our guide was very informative and had worked for 19 years as part of the archaelogical team on the site. We first visited the museum for a brief overview and learning about the key monuments we would visit. There were some excellent scale models which had been constructed to show what they would have looked like in their time. 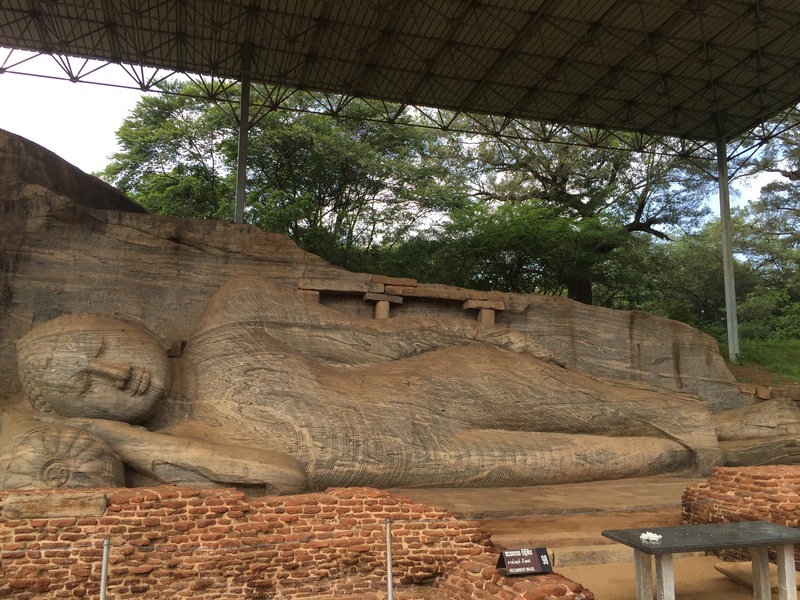 We visited the sacred quadrangle and several massive statues – one of which was a 14m high reclining Buddha. 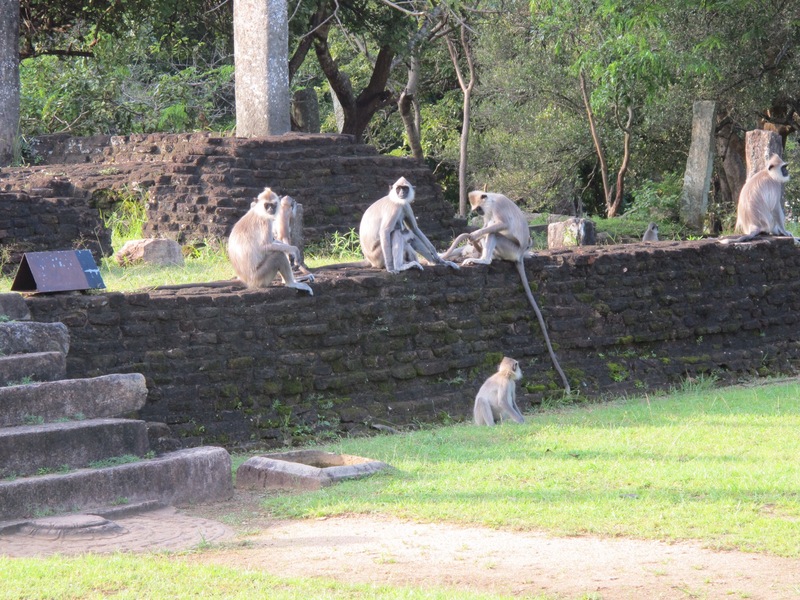 There are monkeys everywhere at these historical sites and we were able to see three species in the one afternoon – white faced, black faced and red faced monkeys. They are prolific breeders and there were always a young baby or two which were mesmerising to watch. Our tour lasted approximately five hours and an ice block which cost us 40 cents was very welcome at the end. Back to our hotel for a swim in another magnificent pool and then out to dinner at a very local restaurant. The local ginger beer is very good and there are two brands – Lion and Elephant. I prefer the Lion but the Elephant seems more widespread. The local beer is Lion which smells to me like the old KB. Others in the group often remark that is not cold – so pleased I don’t like beer. Leaving Polonnaruwa, we travelled once again by local bus to Dambulla. The bus was very pleasant and not crowded at all so definitely not as adventurous as the journey of the previous day. Today was election day in Sri Lanka so it was a public holiday. The locals were very focussed on this important event and were glued to televisions and large queues gathered in schools to vote. There is postal voting but not absentee so our guide would not be able to vote due to the fact that he was out of his electorate. Upon arriving at our hotel we discovered that they sold capuccinos so we went all out and paid $3 each. It was quite OK – probably the best coffee we have had but certainly not like the cafes of Dulwich Hill. Our tour this morning included a visit to the cave temples. These five caves are filled with over 150 images/statues of Buddha and are high up in the cliff face on the side of the mountain which were reached by many steep stairs. It was quite tranquil and a pleasant way to spend the morning. The afternoon was free time so we decided to have a massage – ayverdic style. We had had one in India so thought we knew what to expect but of course it was different. It started with a head massage whilst sitting in a chair and copious amounts of oil were applied. Then, lying down, both front and back were massaged including scratching the bottom of the feet which almost made me laugh. Unlike western massages, our stomachs and chests were also worked on. We were then placed in a timber sauna for 20 mins. The floor and seat was covered in niem leaves which smelt almost like eucalyptus. It is to assist in the detoxification process. There was a clear panel on the door for our mausses to keep an eye on us – no doubt if we looked too red or faint they would open the door. The final stage involved lying in a wooden coffin like structure, once again with the niem leaves scattered over the bed. Your head protruded from one end and once you were in position, the lid was closed and a towel placed near your neck to ensure no heat escaped. Periodically one of the attendants would come and wipe the sweat from your brow. I think I must have turned very red as there was a lot of discussion and pointing at my face. Finally, the lid was flung open and I was ushered back into the massage room to we wiped free of the oils and sweat and allowed to change back into my clothes. A herbal tea and we were both in a state of bliss. The other optional activity was an elephant safari but we really lucked out because on the way home we saw about 13 wild elephants crossing the road and in the nearby bush. We didn’t have our cameras with us but they are such large peaceful animals and certainly amazing to see in the wild. Due to the election the previous day, all the shops were closed. There was also a government decree that no alcohol was to be sold/consumed. One could only imagine what would happen if this was declared in Australia. Our guide explained it was to ensure the people remained calm as they awaited the election result. An early start the next morning was rewarded with the climbing of Sigiriya Rock. This was the fortress of one of the ancient kings who built his royal citadel on top of the huge monolith, 200m high. At the base of the rock are the water and boulder gardens which are very green and tranquil. The climb was steep and involved many steps, visiting cave murals along the way before reaching the summit to explore royal ponds and pools. It was an amazing experience to look out over the lands of Sri Lanka and imagine what it must have been like several thousand years before. After descending we had a picnic breakfast in the bus which included crackers and cheese, pineapple and banana. The battery in the bus was flat so we had to push start it to enable us to get back to the hotel where we showered, had another coffee and then departed for Kandy – this British retreat in the mountains. So sorry we are not there personally to share the experience but your description is the next best thing, filling us with eager anticipation of experiencing it next year, Bubbha willing and the creek not rising. Another great morning in Tucson with coffee and stories from Christopher and Andrew. We are also sharing Ellie’s Ecuadorian experiences as well so it is fantastic to take these trips without leaving the farm. Can hardly wait until next year for the massage experience.